Origin and Habitat: Ptychosperma macarthurii is found only in isolated occurrences in the Northern Territory and Queensland in Australia and Papua New Guinea. 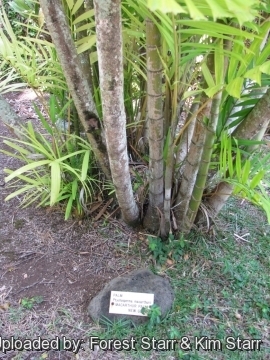 It is widely cultivated elsewhere in the tropics. Habitat: Grows as an understory plant in moist rainforests, broad-leaved riverain gallery forests and in swampy areas. In places where a large tree has fallen, letting in more light than is usual, this plant responds with great vigour. 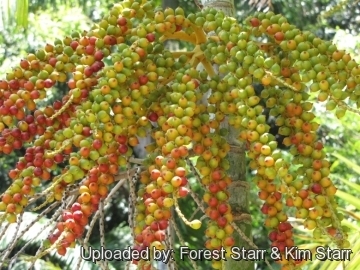 Description: Ptychosperma macarthurii is a small highly attractive palm usually spreading cespitose or rarely solitary. Although able to reach 9 m in height, it is of variable height and is most often seen 3-5 m in height with a variable spread, depending on the growing conditions and environment. This is one of most common Ptychospermas in cultivation. Trunk: Multiple suckering freely at base, slim, barely ringed, grey up to 7(-8) m high, 7-10 cm in diameter. Crown: Open, with 8-10 sub-erect leaves, irregular in outline or silhouette with a frond spread between 1,8-3 m.
Crownshaft: 50-60 cm long light green, somewhat swollen at the base with a waxy white coating. Leaves: 1-2 m long or more, pinnate or feather-shaped, flat and broad, with a slightly arching rachis holding 23-28 leaflets on each side; leaflets 20-40 cm long, soft to dark green, more or less regularly arranged, linear-shaped or slightly widest toward the middle, obliquely praemorse, with margins nearly parallel or tapered apically, jagged and torn ends, prominent midribs with brown or tan twisted ramenta on the underside. Petiole smooth and slender. *Inflorescence: Staminate and pistillate flowers are borne on a yellowish, branched, somewhat bushy panicle up to 60 cm wide, and hanging below the crownshaft throughout the year; Flowers are inconspicuous, off-white or whitish-green. Fruit: A small roundish to ovoid drupe with remnants of the stigma at the apex, 12-16 mm long, green becoming bright red when ripe which ripen year-round. 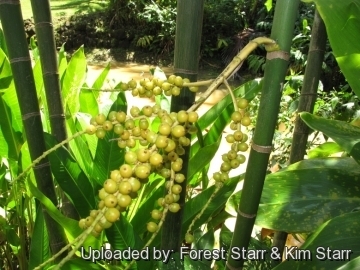 The fruits are showy in fabulous contrast with the green foliage. Seed: Ovoid, deeply (3-) 6-grooved, 9-10 mm long, 5-7 mm in diameter, with homogeneous endosperm. 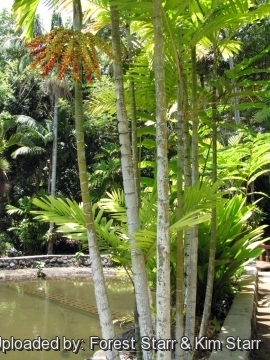 Notes: Ptychosperma macarthurii is similar to Ptychosperma elegans but the latter is a solitary and taller palm with ascending rather than drooping leaflets. 1) Wikipedia contributors. "Ptychosperma macarthurii." Wikipedia, The Free Encyclopedia. Wikipedia, The Free Encyclopedia, 7 Jun. 2014. Web. 8 Sep. 2014. 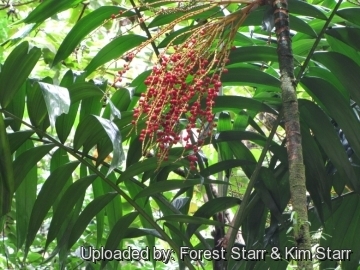 2) Forest & Kim Starr Ptychosperma macarthurii (MacArthur palm). 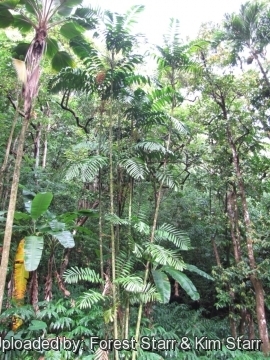 Plants of Hawaii. <http://www.starrenvironmental.com>. Downloaded on 21 August 2014. 5) Gledhill, D. “The names of plants” (2nd ed.). Cambridge: Cambridge University Press1989. 8) White, Alan. “Palms and Cycads.” 1988. 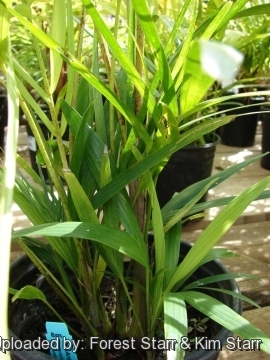 Cultivation and Propagation: This palm is an excellent garden plant adapt to different tropical climates. It is pretty fast growing and the fruits are bright red making it useful as an ornamental. 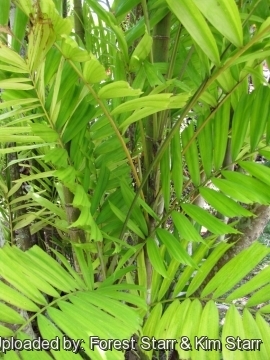 It is a hardy, easy to grow palm that practically thrives on neglect in the tropics. It is also one of the most elegant indoor palms. Soil requirements: It prefers well-drained fertile, organic, loamy or sandy soil soils except those that are constantly soggy. However it is adaptable including those that are neutral, acidic, clayey and slightly alkaline. Watering: Though drought and heat tolerant, it benefits from regular watering, especially during the dry seasons and should be watered before the soil completely dries. Don't let sit in water. Indoor, potted Ptychosperma should not be over-watered. They may contract the fungus Phytophthora, if over-watered. Light: Outside they grow best in half sun and tolerating direct sun only after about five years old. Young specimens need protection from direct sunlight and grow best in shady to partly shady locations. With some sun the leaf crowns become larger and the stems attain greater diameters. However, it can grow in various light conditions, from bright light or full sun to full shade, or part sun/part shade. If home-grown, they look their best in bright diffuse light. Hardiness: They grow well in tropical and subtropical climates, however it is one of the only 'hardy' Ptychosperma species that can handle temps down to -6° C without any problems; For safe cultivation normal temperatures should not go below 5°. (USDA hardiness zones: 10B through 11) Where not hardy, grow as an indoor palm in containers. 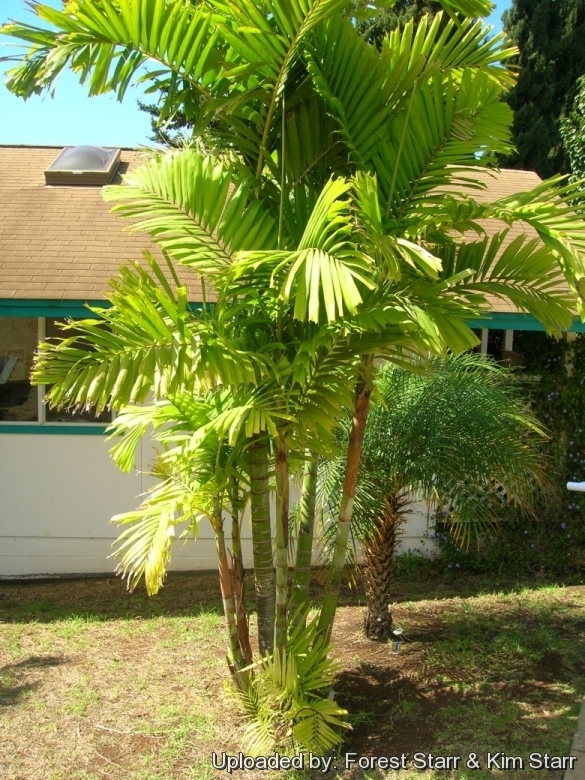 Garden uses: Looking elegant and stately in its clumping habit, Macarthur Palms will be excellent for landscaping. It is grown in open air, in the sub tropical and warm-temperate zones, for the decoration of parks, malls, parking lots and gardens. It is also grown en masse, along sidewalks, road dividers, highways and byways. Because of its reduced size and its elegant look, the Ptychosperma macarthurii proves to be particularly suitable for its utilization in patios and in great open inner courts. It can be container-grown if garden space is unavailable and has a fairly good employment, in pot, for indoor decoration or to add interest at patios, decks, shopping malls and other public areas. Disease & Pests: It is quite resistant to pests but may require regular fertilization to prevent yellowing caused by potassium deficiencies; protect against spider mites, scale insects. It is apparently not susceptible to lethal yellowing. Protect from frost. Propagation: By seeds that germinate well within 1-3 months and are readily available. Germination rate and speed are improved by soaking the seeds for 3 days or by scarifying before planting. It can also be propagated by division of suckers that emerge freely from the parent plant.